Audio Player 6:49 Min. Scroll down to arrow, hit to play. Use Up/Down Arrow keys to increase or decrease volume. 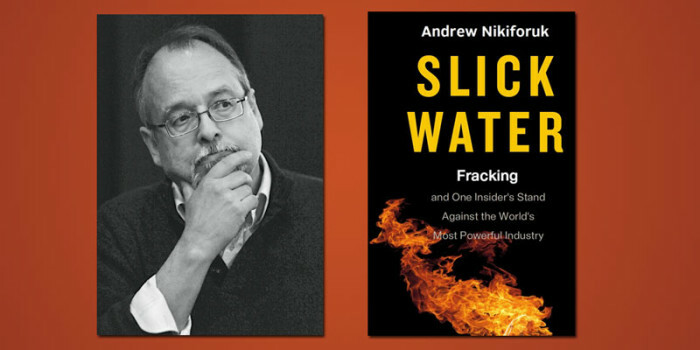 Andrew Nikiforuk‘s latest book Slick Water tells the story of Jessica Ernst, a form oil and gas industry consultant who turned whistleblower on her employer after she discovered that energy giant Encana had secretly fracked hundreds of gas wells around her home, piercing her community’s drinking water aquifer. Since then, her ongoing lawsuit against Encana, Alberta Environment, and the Energy Resources Conservation Board has made her a folk hero in many places worldwide where fracking is underway or is being contemplated. Andrew Nikiforuk interweaves Ernst’s story with the science of fracking and stories of human and environmental repercussions left in its wake.